240J16 Poly V Belt | 240-J16 Micro V Belts | Metric PJ610 Motor Belt | 24 inch Ribbed Belt (610mm) Length, 16 Ribs. Home > Heavy Duty V Belts > Poly-V Ribbed (Micro -V) Belts > J, PJ Section Poly-V (Micro V) Belts - 3/32" Rib Width. > 240J9 Poly-V Belt, Metric 9-PJ610 Motor Belt. > 240J10 Poly-V Belt. 10-PJ610 Metric belt. > 240J5 Poly-V Belt, Metric 5-PJ610 Motor Belt. 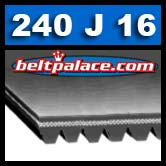 > 240J20 Poly-V Belt, Metric 20-PJ610 Motor Belt. > 240J12 Poly-V Belt. Metric 12-PJ610 Motor Belt. > 240J16 Poly-V Belt, Metric 16-PJ610 Drive Belt. 240J16 Poly-V Belt, Metric 16-PJ610 Drive Belt. MK Diamond CX-3 Concrete Saw Belt #158824. 240J16 Belt. 24 inch. 16 ribs. For multiple applications. BANDO 240J16 belt replaces MK Diamond CX-3 Concrete Saw Belt #158824/ CX3-159345-CX3 (Honda motor). Also used for many popular fitness walkers, exercise bikes and elliptical machines with 24 inch 16 rib belts. Heavy duty Micro-V belt. 240J12 Belt (12-PJ610). 240J-12 Poly-V Belt. 24” OC Length: J Section Motor Belt replaces fitness belts, compressor belts, drive belts, and electric motor belts. 240J-12 Micro-V Belt.